New Hemingway memoir: No love lost for a bygone brand of literary chauvinism. 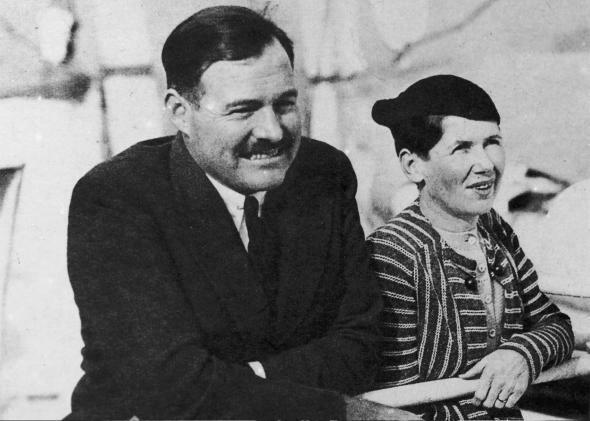 Ernest Hemingway and his wife, Pauline Pfeiffer, in 1934. The latest issue of Smithsonian magazine contains an excerpt from the forthcoming book Hemingway in Love: His Own Story, a memoir by Ernest Hemingway’s close friend A. E. Hotchner. Hotchner, a 95-year-old writer and editor, is perhaps best known for the 1966 biography Papa Hemingway, but in his new book, he has selected a narrower frame through which to consider the literary icon. If the purpose of this tale is pathos and revelation, the effect on the reader—or at least on me—also includes a whole lot of gratitude that “Papa,” with his singular brand of pugilistic chauvinism, is no longer considered the paragon of literary manhood. I never thought I’d say it, but give me Jonathan Franzen any day. What follows are the most Hemingway lines from the excerpt of this ribald new Hemingway memoir. “Flat-chested” versus “full breasts”—I’d say that settles it! • When Richardson leaves Hemingway, he remarks, “I had contrived this moment, but I felt like the victim.” Hemingway and Pfeiffer marry, then divorce: “I’ll tell you when I threw in the towel on Pauline… When she announced she was going to have another baby. The first one had made me bughouse and a second one, howling and spewing, would finish me off.” At one point, he asks Hotchner, “You ever loved two women at the same time?” Hotchner says he hasn’t. “Lucky boy,” says the poor, noble, ill-fated Hemingway. Of course, anyone familiar with the Hemingway saga will know that he married twice more, to two more pioneering women journalists: fearless war reporter Martha Gellhorn and foreign correspondent Mary Welsh. Readers may be surprised to learn that, despite those passions, the writer seems to have spent the end of his life idealizing the beginning—the youthful sweetness of his first literary successes and first marriage.